A lot of brands come to mind when you think action cameras. Ricoh may not be the first one you think of, but supposedly, the brand’s WG-M2 offering has an excellent combination of outstanding features for those who live for both wet and dry adventures. With the Ricoh WG-M2’s simple and straightforward features, it sure is one of the best action cameras around right now. In this article, I will be discussing all the amazing features and specifications of the Ricoh WG-M2 action camera. The camera’s design, audio, video, and photo quality, resolutions and frame rates, battery life, controls, and price will also be tackled. I would like to add that this camera made it to my list of best action cameras for 2018. To add, a comparison the popular GoPro Hero 6 Black will be discussed in detail, so read on if you want to know more about the Ricoh WG-M2 action camera. When you open the action camera’s packaging, you will find everything that you need to start shooting. Here’s what you can find when you unbox the Ricoh WG-M2: the Ricoh WG-M2 camera, a power adapter, a USB cable, a battery, a lens protector, an underwater lens protector, a region-specific start guide, a waterproof design advisory, a lens protection advisory, an Android video playback advisory, a spec correction sheet, and the warranty information with the serial number card. 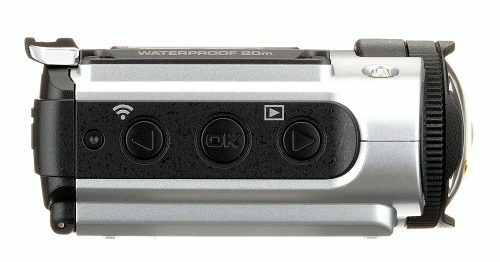 The Ricoh WG-M2 action camera is waterproof up to 20 meters or 65 feet and 7 inches. You will not be needing any additional case or housing, as it is waterproof on its own. It is also shockproof, which would mean that it will not break even if you drop it from 2 meters height or 6 feet and 6 inches. You can take this action camera for snowboarding and it can endure very low temperatures of up to 14°F or -10°C. 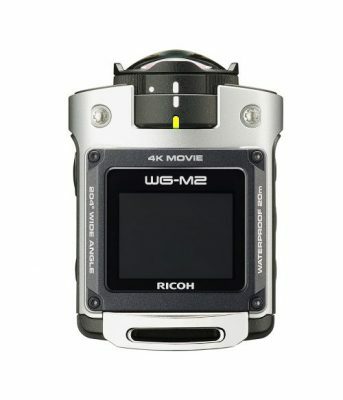 With the Ricoh WG-M2’s caseless design, it is relatively smaller than most action cameras that are available right now. It measures 3.1 x 2.3 x 1.3 inches and it weighs around 4.8 ounces, making it compact, lightweight and ideal for a lot of dry and wet activities. You will also find two different lenses in the action camera: one for below water and one for above water. Lastly, microphone ports can be located at the bottom part of the action camera. The Ricoh WG-M2 is equipped with an 8-megapixel, 1/2.3-inch CMOS sensor that allows you to shoot 4K or 3840 x 2160 resolution at 30 fps, as well as 1080p and 720p footage for up to 60 fps. While it is intended to be used primarily as a video camera, it can still be used to take decent photos for up to 8 megapixels. It also has a burst shooting mode feature for fast-paced still shooting. The video quality of the Ricoh WG-M2 is solid and it is every bit the equal of what you would expect from a current generation action camera including the GoPro. With this, its extreme wide-angle lens will be able to provide a captivating point of view but may have a downside in terms of overall image quality and usability. Like many extreme wide-angle lenses, the Ricoh WG-M2 may have some issues particularly with chromatic aberrations in the corners of the frame, as well as a decrease in sharpness, especially in the extreme corners. While this is not really a huge deal, minor aneurysms might be experienced by pixel peepers. In addition, flare has always been a persistent concern with the bulbous front element on the camera’s lens. With this, the footage will look better when it is facing away from the sun and other light sources. The extreme wide-angle look might also be a problem if you are shooting clips of objects that are not really impressed by the fisheye distortion. You might want to keep the subject at the center of the frame and you should be able to generate favorable results. However, if you plan on shooting an unpredictable and moving object, you should be ready for their faces to look a bit distorted. To add, be sure to always consider proper framing, as your fingers and feet might edge into the frame. Night shots are surprisingly good but will notice a little drop in sharpness. There might be plenty of noise but normally looks like film grain instead of splotchy color noise. This issue can effectively be addressed during post-production with minimum effort. The Ricoh WG-M2 action camera can also shoot stills at 8 megapixels or 4:3 ratio, 6 megapixels or 16:9 ratio, or 6 megapixels or 1:1 ratio. Like the video settings, you will be able to choose your Image Effect Mode, EV compensation, metering, ISO sensitivity, and white balance. However, shots from this action camera might look a little muddy and full of fisheye distortion. Generally, the Ricoh WG-M2 action camera’s 4K at 30 fps shooting mode can produce the clearest results, even if you are not doing a playback on a 4K screen. However, the 4K footage can be more detailed when you watch it on a 1080p screen. The 1080p resolution mode, on the other hand, allows for 60 fps capturing. It is more fluid, which is ideal for action-oriented content. 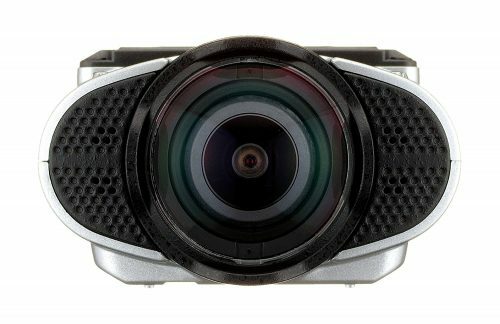 It is also noteworthy that the 1080p’s output IQ deficiencies are not that noticeable when you view it from a living room distance, as opposed to a computer monitor that is normally just inches away from your face. However, if you are aiming for a lean-back experience, you might want to consider capturing with a lower resolution. The Ricoh WG-M2 action camera has a round shape, unlike those that have a rectangular box shape. Its edges, as well as the flat and elongated design, makes it very comfortable to hold. The action camera offers 6 physical buttons: 3 can be found on the left side and the other 3 can be found on the right side. On the left side, you will be able to locate the record and shutter button, the power toggle, and the menu button. On the right side, you will be able to locate the menu up and down buttons, as well as the OK button. At the top, you will find the 1.5-inch color LCD screen, which is considered as one of the major advantages of the Ricoh WG-M2 action camera. While it is very tiny and extremely low-resolution, you may review the videos you just took. This feature will come in handy especially if you need a quick playback. 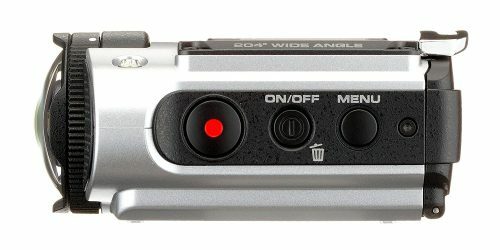 As mentioned earlier, the features of the Ricoh WG-M2 action camera is straightforward, and it is apparent when you navigate the menu system. You might find it a little awkward at first due to the existence of very few buttons but once you get the hang of it, it will be a breeze. Recording a video is very simple, you just need to press the red button to start and stop. By default, the screen shuts off after 15 seconds to save battery. While you may disable this command, it can seriously make an impact in terms of the camera’s overall battery life. For shooting stills, you need to dive into the menu to change the shooting mode. This is because there is no intended button for photo capturing. You can also shoot time lapse, high speed, extended, burst, and underwater videos. 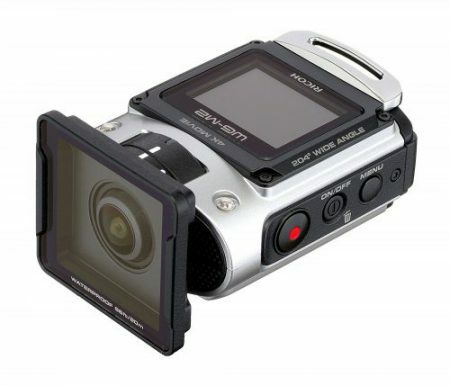 The Ricoh WG-M2 action camera is equipped with a rechargeable Li-Ion Battery D-L168. This should allow you approximately 80 minutes of 4K video, which is also equivalent to at least 450 still images and 160 minutes of playback. With the fixed focus lens feature, you will not experience any delays when shooting because waiting for the camera to adjust the focus will not be necessary. With a price of a couple hundred dollars, the Ricoh WG-M2 action camera is more focused on few main capabilities while foregoing the high-tech features of its competitors. It does not match some of the best action cameras in terms of specifications but it sure does provide you a very durable and Ultra HD action camera for a few hundred dollars less than the nearest competitor. As you may already know, the warranty is already built into the overall price of the action camera. However, the following information should be noted: In the United States, the standard warranty is up to 1 year. You can purchase an additional 2-year warranty for 30 more dollars within a month of purchase. To add, product registration will not be necessary for warranty coverage. In Europe and Canada, you will be covered for 2 years. Lastly, the warranty is good for 1 year in Australia. How Does the Ricoh WG-M2 Compare with the GoPro Hero6 Black? In this section, I will be discussing in detail the comparison between the Ricoh WG-M2 and the GoPro Hero 6 Black. Towards the end, you will be able to weigh each model’s differences, which should allow you to better evaluate your options. For megapixels, the GoPro allows 12-megapixel shooting while the Ricoh only allows 8-megapixel shooting. In terms of video recording, the GoPro has 2160 at 60 fps and the Ricoh has 2160 at 30 fps. Both cameras do have removable batteries, which allows replacement if ever the first one ran out of juice. Three things that the Ricoh does not have are the BSI sensor, a feature that allows better quality captures in poor lighting conditions, GPS, and a touchscreen. In terms of weight, the GoPro only weighs 117.9g while the Ricoh weighs 136g. In terms of height, the GoPro is 44.4mm tall and the Ricoh is only 34.1mm tall. In terms of thickness, the GoPro is 1.26mm thick and the Ricoh is 77.8mm thick. In terms of width, the GoPro is 61.9mm wide and the Ricoh is 57.4mm wide. The GoPro features a stereo microphone, but the Ricoh does not. Both action cameras are compatible with Android and iOS devices, have Wi-Fi connections and is dustproof and water resistant. However, only the GoPro Hero 6 Black supports slow motion video recording. Both action cameras have CMOS sensors, as well as three full subpixels per pixel. However, both have no dedicated bike mount. Both the GoPro and Ricoh action cameras feature an external memory slot, manual white balance, HDMI output, manual ISO, manual exposure, USB mass storage output, offers serial shot mode, rechargeable batteries, battery level indicators, a dedicated camera button, and are weather sealed. However, only the GoPro Hero 6 Black allows waterproofing depth of 40 meters using the SuperSuit housing, has a built-in optical image stabilization feature, allows you to shoot raw, has a USB type-C port, and allows voice commands. On the upside, the Ricoh WG-M2 has a pistol grip, which allows you to hold the device easily using just one hand, while the GoPro does not. The Ricoh WG-M2 is a great action camera, which allows crisp 4K footage and an impressive field of view. First, let’s round up the pros: it can produce high-resolution footage, which is also great to watch on a 4K monitor or TV. In general, colors are accurate, and the extremely wide-angle lens keeps distortions to a minimum, even without stabilization on. Nighttime shots are also great but can be a bit grainy. The controls are also easy to learn and operate. Unfortunately, the action camera also has issues particularly with flare, chromatic aberrations, and fish-eye distortion. While these are very useful features, it does put a limit on the camera’s overall functionality. Shooting with the sun anywhere near the frames has also been proven to cause the video or photo to wash out. Stills are not of perfect quality, but they can pass for Instagram posts. With its weight, size, video and photo quality, and ease of use, the Ricoh WG-M2 action camera is considered a good and lower-cost alternative for a GoPro. While it lacks features including app connectivity, touchscreen, and high-speed video, it is still worth checking, especially if you need something that is capable of 4K video recording.